Although the internet has become a replacement for so many things these days, reading something online does not come near having the same feel and enjoyment as reading a physical hard-cover book. There are so many books out there with so much great knowledge and wisdom, that you are cutting yourself very short if you do not read at least one new book every month. Finding excellent books can be a bit of effort, so I have decided to save you a lot of trouble and give you 10 of the best books I have read in my life. They are all related to self improvement and personal development, but since you are reading this article on Upgrade Reality (a blog about self improvement), these topics should be very welcome for you. The Alchemist is among the best books I have ever read! I got it because Will Smith recommended it as his favorite book. It has sold millions of copies and is translated into many different languages. It is not a book that preaches or commands. Instead, it is a wonderful story about a boy who goes through an incredible journey to seek a gigantic treasure and following where his heart leads him, only to find that the treasure was right in front of him all along. The story is so beautifully and cleverly written and contains many truths and wisdoms about life! Linchpin is the first Seth Godin book that I have read and I absolutely loved it. In fact, it was the catalyst for me to buy more of Seth’s books like Tribes and Purple Cow. I have mentioned ‘Linchpin’ before in my post, ‘Don’t Sabotage Your Own Dreams’. It is a book that reveals the truth about working for a boss, fitting in and following the rules. The only way to create a good life for yourself is to become indispensable, become an artist. Stand out and don’t fit in. Linchpin is really worth reading! Tribes is another fantastic book by Seth Godin. I’m sure you have already read my recent post about it, but in case you haven’t, let me give you a super-quick review. Tribes is a book about becoming a leader and building your own tribe of loyal followers. It explains how anyone can build up huge and powerful tribes with the use of the internet, which has opened a new world of possibilities for just a single person to reach millions. A very useful book in my opinion! Psycho Cybernetics is also among the best books I have ever read. It reveals so many secrets and principles about the human psyche, about fear and about why some people are always positive and successful and why others are not. Written by a plastic surgeon with 20 years of experience who observed the effects of plastic surgery on his patients,this book will really give you something to think about if not change your life. The 4 hour work week is a book about designing your lifestyle and business to automate things as much as possible while actually increasing your income. It is written by Timothy Ferris who was able to create a business online that eventually made him $80 0000 a month with as little as a few hours of work due to all his automation and streamlining. The advice and principles he reveals are priceless and they are easy to understand and apply to your own life right away. Definitely worth reading! The Power of Now is another one of those books that causes a complete mind-shift. Most people (myself included) spend most of their time either reminiscing about the past or worrying or dreaming about the future, while letting the present moment pass them by. The only time that we actually live in, make decisions in and can feel emotions in is right now, the present moment. Those moments where you feel totally alive, those are all in the present moment. The secrets and principles of this book can actually cause you to enjoy your life a whole lot more. 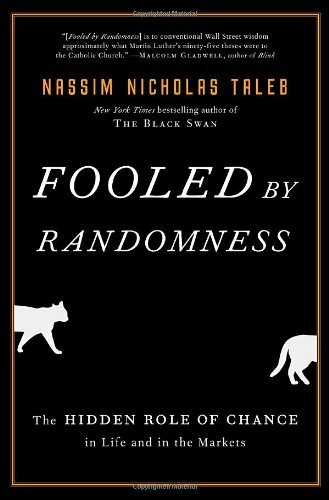 Fooled by Randomness is a very intriguing book. For me at least it was, because I enjoy mathematical theories and statistics about life. Is success directly related to skill and hard work or is there something more to it. Why do some people succeed beyond belief and others never get anywhere? These are among the things that this book addresses and while it may not necessarily teach you anything, it will definitely cause you to do some thinking. The Way of The Superior Man is the best book I have read relating to confidence, inner-strength and having trust in myself. While it is aimed at men, it contains many principles that women would benefit from and enjoy reading. This book addresses many issues about relationships, your life purpose and how to be a man filled with integrity and passion. A must read book for 95% of the male population that struggle with women and with confidence or lack of purpose. Sun Tzu was an ancient Chinese military general with a strong relationship to Taoism. He was always very successful at battle and had a huge influence over Chinese history and culture. He was believed to be responsible to authoring the book The Art of War, which contain many of his strategies and ways of thinking. Not only this, but how they can apply to your own life or business, specifically to business and marketing. A very very interesting book to read! Neil Paricha is the author of a website called 1000awesomethings.com. His site became so big and popular that he decided to write a full-size hard-cover book called ‘The Book of Awesome’. 10 Great Books That Everybody Should Read At Least Once < Please leave a comment on this post. Get my free self-improvement ebook jam-packed with 117 proven tips to improve your life. For good. Cloud Living - The perfect, no-nonsense guide how to make money with affiliate marketing and blogging.Glen Allsopp wrote it. Glen makes 5 figures monthly.